I recently bought the Audio-Technica AT-LP60 USB turntable for the purpose of writing a tutorial on how to digitize vinyl records with Audacity. Since I have been personally using this turntable, I decided to write a detailed review. High quality turntables can be very expensive. Readers often ask me to recommend a record player with decent sound quality at an affordable price. In my opinion, the Audio-Technica AT-LP60 is the best entry level turntable in its price range and I highly recommend it. This turntable is hard to beat among record players with similar price. However, I suggest you read the entire review to make sure this product fits your needs. On this review you will find valuable and detailed information that would help you make a sound purchase decision. The Audio-Technica AT-LP60USB is a fully automatic belt driven turntable with a USB port. It is advertised by the manufacturer as an “LP-to-Digital Recording System” which makes me think that this turntable was designed specifically for that purpose. I highly respect Audio-Technica because they produce high quality products and have an outstanding customer service, but advertising the AT-LP60-USB as a “Recording System” is just a marketing strategy. Don’t get me wrong, I think this is a great product, but the advertising can be misleading. The turntable doesn’t do the recording itself, it’s the software and the computer who does the recording. I have seen many consumers disappointed because they found the recording process difficult and time consuming. The reality is that ANY record player can be used to transfer your music to a digital format even without a USB port. You just need the right software and the right connection to make it work. Think of this product as a nice, easy to use, automatic record player, with the added benefit that you can use it to digitize your vinyl collection. But don’t buy this just because it’s advertised as a recording system. Remember that any record player will do the job. My suggestion is to look for the record player that best suits your needs and your budget. Some people prefer ease of use over sound quality, I prefer sound quality. If you are looking for an quick and easy solution to digitize your music, you may consider a turntable with a built-in CD recorder like the ION CD Direct or the ION LP 2 CD or the ION iLP that allows you to directly transfer your LPs to an iPhone, iPad or iPod touch. For more options, read my article 20 Turntables that Convert Vinyl to Digital Without a Computer. 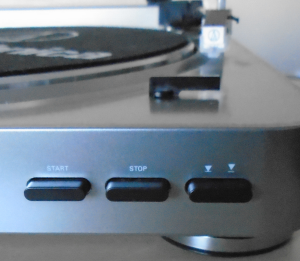 This is a great entry level turntable with a very decent sound quality. If you are new to the world of vinyl records and you are on a budget, this turntable will exceed your expectations considering its price. If you are unfamiliar with how to calibrate a turntable and you just want an automatic player that is super easy to operate, the Audio-Technica LP60 is right for you. Weather you are starting a vinyl collection or you already have one, this turntable will give you a good listening experience without emptying your pocket. It has the best combination of price , easy of use and good sound quality. If you bought a cheap self-contained turntable in the past, consider this player a good upgrade, you’ll notice the difference in sound quality. The Audio-Technica AT-LP60-USB really surpasses its competition. I believe that this is one of the best options for the average consumer. The AT-LP60USB is also a good option for someone wanting to digitize their vinyl collection with a good sound quality. Just remember that it’s going to take some learning if you are not familiar with recording software. If you don’t want to go through the trouble of learning the software and spending time recording your albums then this turntable isn’t for you. Instead, get a record player with a built-in CD or USB recorder or with direct connection to your portable audio device. I don’t recommend this record player to audiophiles needing fine adjustment features. This player is not for you if you want to directly record your analog music to a CD. This product is not suited for a non-technical person wanting an easy solution to digitize a large LP collection. 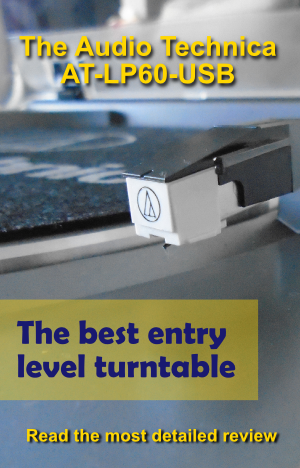 Most entry level turntables have a ceramic cartridge. 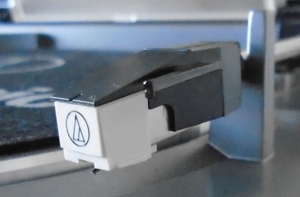 The Audio Technica LP 60 has a dual magnet cartridge. Magnetic cartridges produce better audio signals. The drawback is that magnetic cartridges produce a low level electric signal that needs to be amplified to a line level, hence the need for a preamplifier. The other disadvantage is that magnetic cartridges are more sensitive to external vibrations. But in general, magnetic cartridges perform better than ceramic ones and they tend to skip less. Having a magnetic cartridge is one good reason to buy this turntable over one that has a ceramic cartridge. The cartridge on this turntable is fixed to the tonearm, it cannot be replaced or upgraded. Different cartridges need a specific weight or tracking force to function properly, but this turntable does not have a counterweight to set the proper tracking force. The tracking force is factory adjusted and cannot be modified. It wouldn’t make sense to have a replaceable cartridge if the tracking weight can’t be adjusted. That is why the cartridge is fixed on this particular unit. This cartridge and its stylus is appropriate only for 33⅓ and 45 rpm speeds. You cannot use this turntable to play 78 rpm records. The stylus has a 0.6 Mil (0.0006 in) spherical diamond tip. The stylus will last approximately 400 hours. You’ll notice a loss of high frequencies and some skipping when the stylus is worn out. If you need to replace the stylus look for the ATN3600L. You can also upgrade the stylus with the ATN3600DLXI. Those are the only two options you have for this turntable. Other than that, this unit cannot be upgraded. If you need a better sound quality, your only option is to upgrade other components like your speakers or get a better turntable in the future. 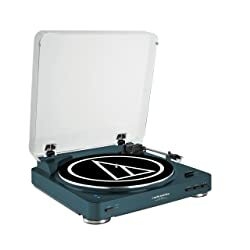 If you need a record player that can be upgraded and adjusted you may want to consider the Audio-Technica AT-LP120-USB. This turntable is fully automatic. When you press the start button, the tonearm will be automatically positioned at the beginning of the record. When the needle gets to the end of your record, the tonearm will automatically return to its rest. You have the option to operate the tonearm manually by using the tonearm lift button. This is very useful if you want to play specific tracks. In order for the tonearm to drop at the right position, you need to specify the size of the record with the size selector. Only 12 in and 7 in records can be selected. This does not mean that you won’t be able to play other sizes, but you would have to operate the turntable manually. For example, if you have a 10 inch record, you would have to lift the tonearm with the lift button and position the needle manually. As we stated earlier, the tonearm is permanently attached to the headshell assembly and the cartridge can’t be replaced. The tonearm is straight and cannot be upgraded either. This means that if you want an S-Shape tonearm, you would have to get a different model. This unit doesn’t have adjustment features like counterweight, anti-skate or height adjustment. The tracking force is about 3 grams, which is heavy compared to high end turntables, but it wont eat up your vinyl records. Other low end turntables have tracking forces of 5 grams or more, which could really damage your records. So, you are safe with this one. Some people have complained that this unit does not have a clip to secure the tonearm, this could damage the turntable during transportation. I personally think that this is a good design because users could forget to release the tonearm before pressing the start button. This could damage your unit. If you need to move the unit, just secure the tonearm with a plastic tie during transportation. If for some reason the automatic mechanism gets out of sync, for example if it doesn’t drop at the right position, you can re-sync the turntable by pressing the stop button, holding the tonearm with your fingers and turning the platter 10 times in a clockwise direction. This happened to me once when I transported my record player. I guess it moved a lot inside the car. But it was an easy fix. The Audio-Technica AT-LP60-USB supports 33⅓ and 45 rpm playing speeds. You should not play 78 rpm records on this phonograph. 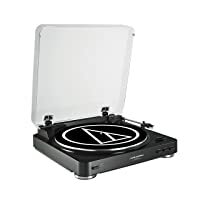 The platter is made of aluminum and it comes with a black slip mat made of felt with the Audio-Technica logo printed in white. This is a belt driven turntable, the platter is not directly attached to the motor, it rotates with the help of a rubber belt. 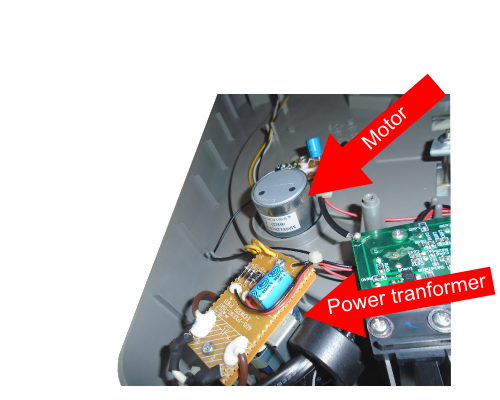 On direct drive turntables the platter is directly attached to the motor shaft. There are some misconceptions about the type of drive. Many people think that direct drive turntables are better than belt driven ones. This is just not true. There are many high end turntables that are belt driven. Direct drive turntables are generally made for DJing, because they have higher torque. Belt driven record players are normally designed for audiophile listening. The belt helps attenuate the noise coming from the motor into the stylus. One disadvantage of belt driven turntables is that you may need to replace the belt some time in the future depending on how much you use your player. The good news is that replacing the belt is fairly easy to install and you can find replacements on eBay. This turntable comes with a power cord and can be connected to a AC 110V 60Hz power source. If you live in a country where 220V, 50Hz is the norm, buy the product locally and carefully read the specifications. Even if you get a voltage converter, the rotation speed of the platter may not be accurate due to the frequency of the alternating current. For example, if you buy this product in the UK, the power pupply requirements is 230V AC, 50 Hz. Some consumers have complained about speed inaccuracy and noticeable pitch variations. I have not noticed this problem on mine. I listen to classical music albums with long note passages where speed variations are more noticeable, but they sounded fine. Of course, the ability to discriminate pitch variations is different for each individual. The only objective way to measure this is by using a test vinyl record. At the moment I don’t have one but I’m planing to buy one on the near future. If I measure my unit I’ll update this review. According to the user manual the wow and flutter is less than 0.25%. I think this is a decent value for this type of record player. High fidelity, top level turntables can reach values of less than 0.05%. 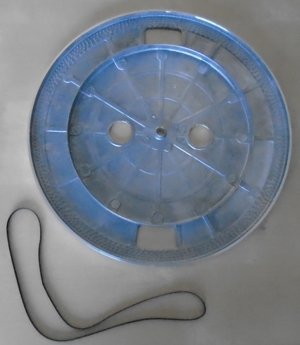 Before using the turntable you need to install the platter and belt. This is very easy to do, but make sure you read the instructions and follow the video provided by Audio Technica. Some people have mistakenly installed the drive belt on the white plastic post instead of the brass motor pulley. 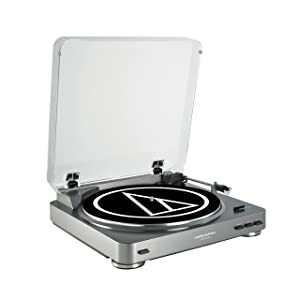 Recently, Audio Technica released the Bluetooth version of this great automatic turntable, the AT-LP60-BT. So I decided to update this article. At the time of this update, I’m aware of only two turntables that have wireless Bluetooth connectivity: the ION Audio Air LP and the Audio-Technica Bluetooth Turntable. In my opinion, the best bluetooth turntable beign the AT-LP60-BT. What follows is a table comparing the different variations of this fully automatic record player. Like many record players, this turntable cannot produce any sounds by itself. It doesn’t have built in speakers. You need to hook it up to a sound system, amplifier, receiver or a set of powered speakers. There are many possible setups for this record player and it would be impossible for me to explain all of them. I’ll explain the basics and I’m sure you will be able to figure out the best setup for your particular needs. USB – The Audio Technica AT-LP60 USB has a USB port. 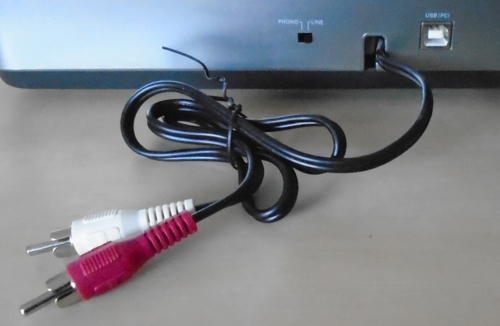 You can connect your player to your computer using the USB cable included. This is a convenient way to transfer your music to your computer using any recording software. Included is a CD with the the recording software Audacity, but is best to download the latest version from their website, since this software is in constant development. The USB does not need any special drivers and it is supposed to work on Windows, Linux and Mac. I have both Linux and Windows and it works well with both. The only problem is that the USB output signal is very low. 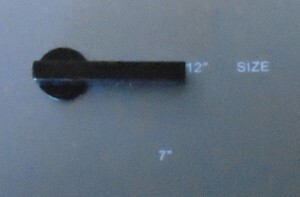 PHONO – The turntable has a stereo RCA output cable. Set the preamp selector switch to PHONO if your receiver or home stereo system has a PHONO input. Remember that magnetic cartridges produce a weak electric signal. This type of signal is called phono level signal. 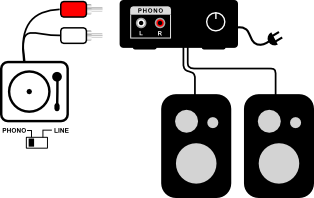 If your home stereo or amplifier does not have a PHONO input you will have to connect the cables to the LINE or AUXILIARY input. LINE – This unit has a built in preamplifier for convenience to the user because many amplifiers or home stereo systems nowadays don’t have a PHONO input. Remember to set the preamp selector switch to LINE if you want to connect your player to a LINE or Auxiliary input. The record player comes with two adapters that come in very handy if you want to connect your turntable to a 3.5 mm line input. Female RAC to 3.5 mm female jack adapter. You can use this adapter to connect headphones or powered speakers. Note that the turntable does not have a volume control. You would have to control the volume from your headphones or speakers. Female RAC to 3.5 mm male jack adapter. You could use this adapter to connect your player to a 3.5 mm line or auxiliary input, or to your computer’s sound card. The RCA cables are hard wired to the unit. Many consumers don’t like that and neither do I because the cables are too short. Expect to spend some extra bucks on some extension cables if you decide to buy this product. Also, this record player does not have a ground wire, but I have not experienced any humming caused by a ground loop so far. The most asked questions about this product relate to the possible different audio setups. Many people new to vinyl ask “What other equipment do I need to buy to make this turntable work?”. This is not a self contained player and does not have built int speakers. It needs to be hooked up to powered speakers or to your home stereo system. There are tons of audio devices and brands that would work well with this product and many possible setups. It would be impossible for me to list them all. Instead, I made some diagrams of the most common setups that will work with this product. I think the simplest way to use your record player is to hook up a pair of powered speakers or computer speakers. Note that the speakers on the image have a power cord. If your speakers are not self powered they won’t work. Some people have asked if this can be connected to a guitar amp. The answer is yes, your guitar amplifier is a powered speaker. Just make sure you have the right cable adapters. You will probably need a mini jack to ¼ inch jack adapter. For this setup you’ll need to set the preamp selector to LINE. Notice that the preamp selector must be set to PHONO for this setup. The speakers don’t have a power cord. 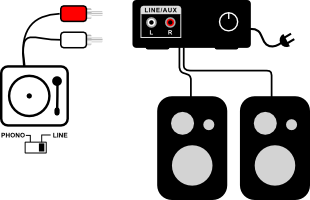 The speakers should be connected to the receiver or amplifier. Set the preamp selector to LINE. It is possible to connect headphones to this unit by using the provided RCA to 3.5 mm female mini jack adapter. However, it is not a practical solution unless your headphones have a volume control. LINE must be selected on the preamp selector switch. If you happen to have a good phono preamp, you may consider bypassing the built in one. Or you may want to buy a better preamp than the one included with the record player. In this case you would have to select PHONO on the preamp selector switch. It would look something like this. You can connect the phonograph to your computer using the USB cable provided. This will help you transform your albums to a digital format with the help of any recording software. 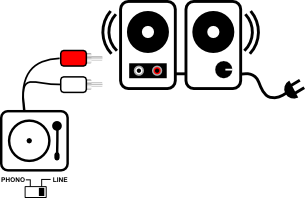 To monitor USB output during recording you can use your computer speakers, headphones or you may plug in a set of powered speakers directly to your turntable. You can also connect your record player to your computer’s sound card using the RCA to 3.5 mm male mini jack adapter. 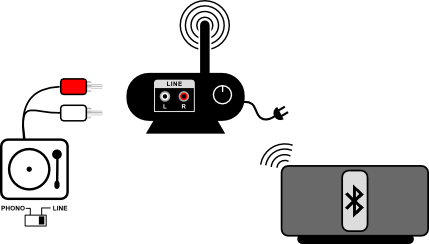 You can wirelessly play your vinyl records by plugging your turntable to a wireless transmitter as shown on the diagram. Some wireless transmitter also have a 3.5 mm input. On many receivers, there is a USB port. This is generally meant to be used for storage devices. The AT-LP60USB is not a storage device. This setup will not work unless your receiver supports USB audio streaming. Many consumers have complained about the software that comes with this product. I decided to write a separate section about the software because there is a lot of misunderstanding. Most complains come from people that found the recording process time consuming and the software difficult to use. These consumers bought the product looking for an easy and fast solution to transfer their LPs to a digital format. Despite being a great product, the AT-LP60-USB has received many low rates because of the software. Keep in mind that the software is not part of the product, it’s just an audio recording tool that Audio Technica recommends because is a wonderful recording software and can be downloaded for free. If you are unfamiliar with recording tools, you may find the software difficult to use. I encourage you to try it and learn to use it, after passing the learning curve you’ll realize how useful this tool is. Not only for transferring vinyl records but for editing any type of audio. You can read my tutorial on how to digitize your LPs with Audacity for more information. 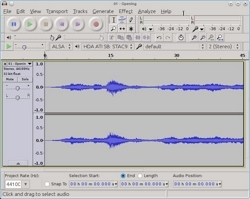 The audio recording software recommended by Audio Technica is Audacity, which is a free audio editing and recording tool. It’s a wonderful tool but it wasn’t designed specifically for digitizing LPs, so it has a lot of features that you may not need. It is in constant development, so it does not make sense to use the CD that comes with your turntable. My advice is to download the latest version from their website, don’t use the one on the CD because it is most likely outdated. EZ Vinyl/Tape Converter. Developed by MixMeister in conjuction with ION and Neumark. This software is to be used with ION and Neumark prodcuts only. It does work with the AT-LP60 USB. However, you should be aware that there may be legal implications. You’ll find that some of the other applications are just as complicated as Audacity if not more, and you’ll have to buy them. I’m sure there are other options but this list is enough for the majority of users. If I find better options I’ll make sure to update this post. Although this turntable does not have the sound quality of top high fidelity turntables, it has a very decent sound quality for the average listener. It produces a very clear and warm sound. And because of the magnetic cartridge you’ll find that the sound is much better than the one produced by cheap turntables with ceramic cartridges like the Crosley Cruiser or the Jensen JTA-230. Of course it also depends on the quality of the rest of your audio equipment. When judging the sound quality of a turntable it is very important to keep in mind that the quality of the sound coming out of the speakers is the result of a very complicated process that involves all the audio components. I call it the “Sound Quality Chain”. If you pair up your Audio Technica AT-LP60-USB with a good set of speakers and a good receiver you will be very pleased with the results. However if you connect your record player to one of those small portable speakers, don’t expect to have an amazing listening experience. Always keep your records clean and in good condition because this also affects sound quality. There are three versions of this turntable. They comes in different colors depending on the model. Audio-Technica constantly changes their models, therefore it’s hard for me to keep this article up to date. You can check Audio-Technica’s website for up to date information about therir turntables. AT-LP60 without USB. Available in silver, royal blue, pink and black. AT-LP60-USB with USB connection. Available in silver and black. AT-LP60-BT wireless turntable with Bluetooth connectivity, without USB. Available in white, black and navy. 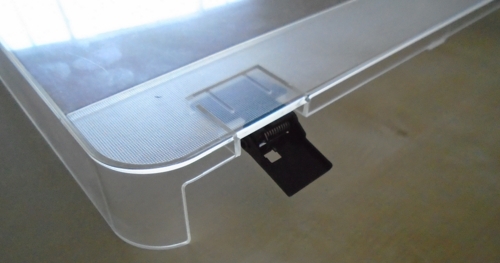 The unit is mainly made of plastic, except for the platter which is made of aluminum. It has a nice simple clean design and looks very elegant.When carried, it has a flimsy feel. It comes with a removable clear dust cover. I have seen complains that the dust cover gets scratched easily. I have confirmed this fact, but that is what the cover is for, to protect your records and your player. The AT-LP60 turntable has gained very good ratings. Consumers appreciate the ease of use and the easy assembly. The sound quality is remarkable compared to other turntables with a similar price. Consumers brag about Audio Technica customer service. There are many people that have had this turntable for over a year without problems. Most consumers are satisfied with the quality of their recordings, but many complain about the complicated software. Speed inconsistencies like chipmunk-like overspeed, and noticeable wow and flutter. I have not had this problem with mine. Flimsy buttons malfunctioning after some time. The malfunctioning buttons can be fixed by opening the unit from the bottom to realign the metal rods. The recording level from the USB port has repeatedly reported to be extremely low. After recording you have to boost the volume with the software. I have confirmed this myself. I get better results by connecting the turntable directly to the sound card. Some consumers have reported skipping with new albums. This also happens with other turntables because of the way new records are made and mastered. You can reduce the chances of skipping by placing your record player on a perfectly leveled surface. Some defective units have been reported, like units not turning on or off. The good thing is that Audio Technica has a great customer service and they will make sure your issue gets resolved. Don’t hesitate to contact them if you have any issues. Audio Technica offers a 1 year limited warranty. Users not able to monitor their recording when using the USB port. This is not a problem, in Audacity go to Preferences ->Recording -> Playtrhough and select the option “Softaware Playthrough”. For more information, consult my tutorial on digitizing your LPs with Audacity. For more information on this service bulletin click this link. Click the link download the manual. The Audio Technica AT-LP60-USB is a great entry level turntable with a decent sound quality at a very affordable price. This turntable beats its similar price competitors. This fully automatic turntable is very easy to use and easy to assemble. Best option for for the average listener. Not a good option if you want a simple solution to digitize your vinyl collection because there is some software learning to be done. Not a good choice for someone looking for a more professional turntable with adjustments. Some malfunction units have been reported but remember that Audio Technica has a great customer support. I hope you liked this review. Feel free to leave your comment below. Happy listening! Bought this turn table about a month ago and I have been very satisfied overall but now this week I have noticed “wow” on almost every time I listen at some point of record (usually in the middle) and this is very annoying. What could be the reason to this, something wrong with the belt? I’m very certain that the “wow” wasn’t there before this week. Sorry to hear that! If you are still under warranty, I would contact Audio Techinca, they are very nice. + Try different records. Some times the record is warped or has the center hole missplaced. + Make sure there is nothing stopping the platter from rotating. Like having your turntable close to the wall or something that may prevent the platter from turning. + Try reinstalling the belt. Make sure the belt is sitting on the motor pulley and not on the white plastic post near the tonearm. Follow the setup instructions on the video above. + Check your power source. + Check the service bulletin above. Check your turntable’s serial number. Some units were not adequately lubricated. I hope you find this information useful. If you’re still having issues contact Audio Technica, they have an awesome customer service. Upgrade options for the stylus is the elliptical diamond from LP Gear. CFN3600LE. Elliptical tips will track much better than the stock conical ones. Conical stylus will also wear out the grooves of your records faster. I wouldn’t put a conical stylus on my records. I bought this recently and set it up to my Pioneer receiver under phone with a 12 ft extension cable but I’m getting a very noticeable humming. I noticed you said you don’t notice any humming but without a ground wire I’m not sure what to do here. Is there a way to install a ground wire myself? The humming is not there when using “line” in the aux input on my receiver. Thanks for your comment. I don’t have that problem with my AT-LP60 USB. Have you tried a different cable? Have you tried with the RCA cable that came with the AT-LP60 USB? Make sure your RCA cables are shielded. Check other connections around your turntable and your receiver. Some times other electric fields may cause the humming. If possible, connect your turntable, receiver and speakers to the same power outlet. Hope it helps. Let me know if you need any more help. Sorry if this is a dumb question but how do you “shield” RCA cables? It’s not a dumb question. Just buy them shielded. Search for “Shielded RCA Cables”. If you feel like making them yourself you can follow this tutorial. I’ve loved reading your reviews. I’m definitely considering getting the AT-LP60 over any Crosley record players. However, I move across the country a lot. How would you suggest carrying it on a plane or car? How should I pack it and which components should I secure/take out if I want to put it in a carry on or backpack? Probably one of the only things Crosley has on Audio Technica is portability! Thanks for your comment. I don’t recommend taking the AT-LP60 across the country. You may want to consider the Crosley Collegiate. I just published a review about this portable turntable. Anhother option for you would be to find a vintage portable player. A relative found some very thin old 8″ 78 rpm records from 1954 – some ancestral family hobbyist had got some of his reel-to-reel material pressed “for posterity”, little knowing that 78s were about to go the way of the dodo. Unfortunately my LP60-USB had only 33 and 45 play speeds, and no option to mount a 78-compatible stylus. “78” grooves apparently are wider and a bit deeper than those on 33s or 45s, so a skinny stylus would run back and forth in the wider groove, but what’s a guy to do in a pinch… The material was mostly voice, with a few home-recorded instrumentals, so I went ahead, set the speed for 45 and started recording (in Audacity). When done the initial recording, I exported to .WAV, and then later processed using Audacity’s Effects/Change Speed: source 45; destination 78 (compressing frequency by a factor of 1.73); then exported the processed job to .mp3. It actually sounded not too bad, and the old folks were happy with the result. I only hope I haven’t scuffed up my stylus too badly!! Very interesting. That is a great way to digitize 78 rpm records. You could buy a 78 rpm stylus from LP GEAR if you ever want to try. This stylus will fit the AT LP60 USB. Thank you for your comment, I’m sure others will find your recording tips very valuable. It’s NOT “vinyls”. That word makes me sick to my stomach. Refer to them by their correct name: “records”, “vinyl records”, but NOT “VINYLS”. Thanks for your comment. I think you are right, “vinyl records” is better. When I have time, I’ll go through all my post and fix them. In the mean time, I think people get the point. Sorry to hear that. Mine works perfectly. + Press the lift button so that the tonearm is up. + If it works, then it’s likely that your vinyl record ends before the auto-return trigger point. In this case, there is nothing you can do. You’ll have to manually return the tonearm to its rest. + If it doesn’t work, then your unit is defective. I would call or email Audio-Technica. They have an awesome customer service. I imagine there is a way to change the trigger point, but that would require you to open the turntable an you probably don’t want to do that. I haven’t mess with it my self. Hi Francisco, I loved your review. I’m new to the vinyl world, and I would appreciate your opinion. I have an old mini stereo 2.1 LG Home Theater, and I was thinking about upgrading the LG speakers to the Pioneer BS22 Andrew Jones speakers, connect them to the receiver in the LG subwoofer, and buy the AT LP60. Does that sound like a decent entry level audio equipment to start?? Or the receiver in those mini home theaters are just awful? I’d appreciate any thoughts! It sounds like a good equipment to start. I would like to know the model number of you Home Theater. Just to make sure. You’ll love the ATLP60. I recently bought AT-LP60 and I have no problem using it and so far it sounds good. I know that the cartridge couldn’t be upgraded and I have no intention to upgrade it. But what if the cartridge is broken? Can I just replace it with same model, or I have to buy another turntable? Thanks a lot. As far as I know, Audio-Technica does not sell the cartridge. You can only replace the stylus. The cartridge is attached to the tonearm. So, you would have to buy a new turntable. Again, I’m sorry to bother you with my questions since I’m new to this. But I want to know how long (approximately) lp60 cartridge would last? What’s the main cause for cartridge to be broken and how can I prevent that to happen. Thank you so much. Are you talking about the stylus or cartrdige? The cartridge should not degrade. The wires may get damage over time, but I’m talking about many years assuming you take care of your turntable. Just handle the tonearm with care and when you change the stylus, be careful with the cartridge and follow the replacing instructions. Some times the wires may get loose. Just check them in case you don’t hear one channel. Just treat your turntable nicely and you will be fine. If you are talking about the stylus, then it does degrade with time. I would say, about 600 hours of play time. Make sure you never touch the needle with your fingers even if it is dirty. Use a stylus brush instead. Maintain your records clean so that your stylus lasts longer. The cantilever is very fragile and can break so don’t touch it. Secure the tonearm when moving your turntable and cover the stylus when not in use. I hope I answered your question. Let me know if you need anything else. Would like a review of the Numark PT01 Touring, I have considered this model but i’m leaning towards the LP60. Also how to transfer vinyl to mp3 if the LP60 doesn’t have a USB port? I like the portability of the Numark but i’m concerned about quality sound as well. Thanks for your comment. I will put the Numark PT01 Touring on my waiting list. The LP60 doesn’t have USB but the AT-LP60USB does. However, it’s a little bit more expensive. 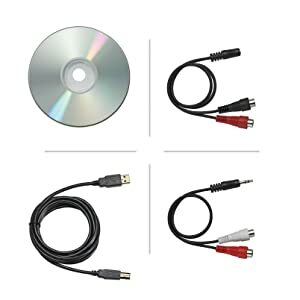 You can still record without USB by connecting the turntable to your computer’s sound card via de RCA to 3.5 mm adapter cable. If you need assistance with this procedure let me know. Among the entry level portable record players, the Numark PT01 Touring is a very decent one. I like that it has audio outputs so you can connect it to external speakers. And it also has USB which will allow you to digitize your vinyl records. I still prefer the quality of the AT-LP60, but it’s not portable and doesn’t have built-in speakers. Thanks!! I think I’ll be going with the LP6O! I’m sure I’ll be needing assistance on connecting it to soundcard for digitizing once i get it. Soy nueva en esto. Me gusta mucho esta bandeja technica, aunque no entienda mucho, yo solo lo quiero para disfrutar de la musica. Quiero saber si leera cualquier tipo de vinilo? Este toca-discos toca vinilos de 33 1/3 y 45 revoluciones de diferentes espesores. Es decir, los discos largos (LP) de 12 pulgadas y los discos chicos (singles) de 7 pulgadas, que son los mas comunes que te vas a encontrar. Este aparato no reproduce discos de 78 revoluciones, pero es raro encontrar estos. Esta torna-mesa es muy buena y fácil de usar. Te la recomiendo ampliamente. Considera que vas a necesitar un para de bocinas. Puedes usar unas bocinas de computadora. También puedes usar un amplificador, estereo o centro de entretenimiento con bocinas, pero necesitarás gastar un poco más en este caso. Es común que las personas ya tiengan en casa algún tipo de bocina o estereo. Si tú tienes uno, lo puedes usar. Espero haber sido de ayuda. Si necesitas algo más, estoy para servirte. I’m working on it. 🙂 I haven’t upload the video yet. Sorry! I’ll hurry and have it ready soon. I’ll make sure to let you know when ready. If there’s something in particular that you want to address, let me know so I can include it in the tutorial. Hi! Can i connect it on Marantz Nr1604 receiver thru usb ?? I can t find any details does Nr1604 supports usb audio streaming?? Can you help me?? No, the LP60 USB cannot be connected to your Marantz Nr1604 thru thye USB port. The USB port on the Marantz Nr1604 is only for storage devices. It’s not for audio streaming. The USB on the AT-LP60-USB uses an “USB Audio CODEC” that is not supported by your receiver. You would have to connect your turntable to one of the AUDIO IN inputs on the back of your receiver. Hi, I currently have a Crosley which skips a lot. I am going to get the LP60 although I’m worried about this turntable skipping heaps as well. Would you have any advice about going forward with this purchase and about the skipping problem? Are you talking about the Crosley Cruiser? With the LP60 you won’t have skipping issues, unless your vinyl records are already damaged or dirty. The difference between the Crosley Cruiser and the AT-LP60 is huge. Just make sure to sit your turntable on a leveled surface and keep your records clean and in good condition. I highly recommend the AT-LP60. You won’t regret your purchase. Yes, it is the crosley cruiser. When I was reading your review I noticed that customers complained about skipping when playing new records, so hopefully this doesn’t happen to me. Nice review though and thanks for your advice and recommendation. Jason, I have this table and I am strongly considering returning it. It’s been 2 months, and I’ve already had multiple skipping issues. I’d hate to return it because my girlfriend got it for me as a birthday gift, but the fact of the matter is that the player does skip. I’ve had skipping issues on multiple new albums. It’s not every album, and it does track well in most situations. However, it’s very frustrating when you just spent $20-$30 on a brand new album and you come home to deal with skips. I have also played each record on a friend’s table to see if it was the record or the table. Each time the record played through flawlessly with a higher quality table. I would suggest saving a little more for something like a U-Turn or a second hand option. Sorry to hear that. I know how it feels when you buy a record and you can’t listen to it. If your new records played well on a better turntable, then I would just return the turntable and get a better one. I think your girlfriend will understand. I have recently purchased an at lp-60, wish I had read your review before purchasing. I have had no sound issues apart from one record which was a 12″ single that was playing to fast at 33 and too slow at 45. Is there an in between speed, I have bought another 12″ single which has worked perfectly. The auto function is very good and the sound quality is ok, well good enough through my edifier m3200 powered 2.1 speakers. Although if I play my PC though them with a digital version of the album, in this case 10cc, the PC is clearer cleaner and clinical. Could the player need an amp and better speakers? Your turntable would improve sound quality with better speakers and a good amp. But the way you have it set up should perform similar to your computer. The result you are getting really depends on the record you are playing. If the music is too old and it has been remastered and digitized, you’ll find that there is less background noise on the digital version. The digital version may be cleaner and changing your speakers wouldn’t make much difference. I would love to listen the difference if you have a way to record and send it to me. I would also like to know what is the 12″ single you are talking about. Seeing as the record player only has RCA cables and a USB cable, and all I’m really looking for is a straight connection from record player to the soundbar, I could see how this may not work (unless you have a suggestion?) My other option which I have been seriously considering is selling the AT-LP120 USB record player and purchasing the AT-LP60 instead. My question to you is, seeing as the soundbar has bluetooth capabilities, would I be able to make a straight bluetooth connection between the AT-LP60 and the soundbar or would I need some sort of receiver or transmitter? I’m really terrible at this tech stuff and could use a pro’s help 🙂 …In all honesty I don’t even really know what the difference between a receiver and a transmitter is! Thank you and please help!! 1. Locate the audio PORT IN on the back of the bar. This is a 3.5 mm audio port. 2. Take the RCA to 3.5 mm cable adapter that came with your Turntable. It’s the one that has a red an black plugs on one end and a male 3.5 mm jack on the other end. 3. Connect the RCA (red and black) end to the turntable cables. Connect the 3.5 mm jack to the PORT IN on the back of the LG Bar. 4. 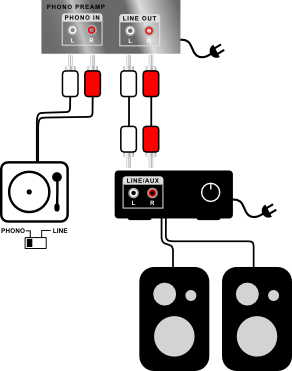 Set the pre-amp selector of your turntable to LINE. Another option is to buy a Bluetooth transmitter. One good option for you would be to buy the new AudioTechnica AT-LP60B-BT that comes with Bluetooth connectivity. Hi! I reserved to buy this at the mall. My only concern is how can I use a bluetooth speaker on this? Is a bluetooth transmitter enough? thanks! Are you talking about the AT-LP60-USB? You can’t use a bluetooth speaker. But there’s another model with bluethood connectivity. Look for the Audio Technica AT-LP60BK-BT. If you are buying it at the mall, just make sure is the right model. Could you do me a favor and record a rock or metal song or something? I can’t find audio recorded from this turntable on youtube. I could help you Connor, but I’m not sure what you need. Do you mean, you would like to hear some examples of digitized music with this turntable? Can you suggest any of your favorite bands or songs? Thanks for your comment Connor. I’ll be waiting for you to respond. I have a dilema, I own right now the Crosley Cruise, I owned it for about 8 month. I like it, it’s fun, looks cute. The sound from it’s built-in speakers is kinda yew, when I plug in to speakers it sounds pretty good, but there’s a lot of noise. Also, I don’t like the fact that the rotation of a record is not flat.. it rotates in a cartoony way up’n’down, unless it’s a 180gram one. I read a lot of bad stuff about crossly, and now I’m very concerned about my records. SO, I’m thinking to get a better version with good decent sound. I really like AT lp60 and I love lp120! But I’m not sure if I really have to spend $300 for lp120 or TEAC TN-300, or I can still get great sound from lp60. SO, the question is should I get Lp60 or it will be not much better than crossly? The difference between the AT-LP60 and the Crosley Cruiser is huge. So, my advice is to go ahead and get the Audio-Technica At-LP60. I just wanted to say thanks for the great review. Every possible question got answered here, thanks! I was looking for honest, non-bias information prior to purchasing a turntable for my son. I appreciate both the thoroughness of the article and the comments shared by everyone who has purchased an AT-LP60. I think I have found what I am looking for. Thanks for your comment. I’m glad you found it useful! Thanks for the in depth review of this product! I also want to ask about my problem with this one, this is not too often happened but this sure makes me wonder how to fix it. Does this problem can be fixed with your resync system?stop > holding the tonearm > spin the platter 10times? And what is caused this problem? Thanks for your comment. Manually spinning the platter clockwise about 10 times will help the turntable finish an unfinished auto-return cycle. This problem may happen wen the platter moves during transportation or if you don’t let the cycle go to full stop after pressing the stop button. The auto-start, auto-stop system is mainly mechanical. Some times the pieces inside can get stuck or get out of place, but this doesn’t happen often. At least mine never does this. But it’s easy to fix if you are not afraid to open the bottom of your turntable. Try the 10 times spin solution. If that doesn’t work, carefully unscrew the bottom of your turntable and visually examine the mechanism. I’m sure you’ll find the problem. You may need to take out the platter and secure the tonearm in order to handle your turntable easily. I’m happy for you. Let us know how it goes. We would love to have your input after some time with your turntable. Super helpful review – I’m choosing between this turntable and the new AT LP60 BT – which comes with Bluetooth, and I was leaning toward the USB turntable because my family has some rare records I’d like to digitize. Does it make more sense to go with the Bluetooth since you can convert regardless? How difficult is it? The Audio Technica AT-LP60-BT is one of the few Bluetooth turntables on the market. It came out recently, so I don’t have one. But I’m very excited about this new feature. I would love to try it out. Digitizing is easy if you are technically inclined. It also depends on the software you choose to use. You don’t really need USB to digitize your music, you can just plug the turntable to the LINE input of your computer’s hardware. Besides, the sound coming from the USB on the AT-LP60-USB has a lower volume compared to the line output. So, if you already have good Bluetooth speakers, go for the AT-LP60-BT. I’ll update this post with information on this new turntable. I’ll also make a tutorial for you to digitize your music. I’ll keep you informed through this post. Wow thank you so much for the immediate response. Oh man, I have a MacBook retina and they eliminated the line input from it – how much more difficult is that going to make it?? If I buy in the next few days I get 30% off of it (retail gig :)) so that helps a lot price wise. I don’t have Bluetooth speakers yet but I anticipate upgrading the just-fine ones I have within a few years – not sure how much I’ll be beating myself up over not having gotten it with Bluetooth. Over the last few weeks I’ve been doing his extensive research into getting my first turntable. I want to get one for a cheap price that will still work well and not damage my vinyls. This turntable sounds like a great option but I have one concern. I recently purchased my first vinyls. They are 180 gram vinyls and I’ve heard that because of this new way to make vinyls that the Lp-60 will actually play the record faster than usual or not be able to play it properly at all. I was wondering what your experience has been with 180 gram vinyl and this turntable. Thank you so much for your concise and clear review. I look forward to hearing from you. The AT-LP60 is a really good turntable for someone just getting into vinyl. It won’t damage your records. Around the same price it’s hard to find another player with a magnetic cartridge. I don’t have any problems playing 180 gram vinyls on my own AT-LP60. my question is – is there a way to connect my android pad into this set up so that I can choose to either play the turn table or the android pad without having to keep disconnecting and reconnecting the cables to/from the Turntable and Android Pad? My powered speaker has a headphone male jack that I am using to connect directly to my Android Pad now. This is a great question. I have not done that but I think it’s possible. I would get a 3.5 mm audio switch box. It should cost around $20. You could also buy a pair of Bluetooth receiver and transmitter. That way you could pair your devices whenever you want without plunging and unplugging cords. If I think of other solutions and let you know. Thank you for this very detailed and informative post!. I grew up using my dad’s vintage player that is now long gone. However, he has handed over his vinyl collection. I had been eyeing this particular player on Amazon as an entry player. Thanks for helping me make my decision. Audio-Technica is a trusted brand and its products are long lasting. You can be confident that your turntable will give hours of vinyl music listening for years. It is true, there is not much room for upgrades. The problem is that must decent turntables that can be upgraded are quite expensive. Really, the Audio Technica AT-LP60 is the best sounding turntable for its price. The Numark PT-01 is about the same price but the Audio-Technica is far better. It also depends on your needs. The Numark PT-01 is portable and has a builtin speaker, if that is what you are looking for then there is no reason to consider the AT. But if you don’t care about portability, go for the Audio-Technica, you’ll be very pleased with the sound. In the future, if you need to upgrade your turntable, you can start by buying better speakers or other audio equipment, and latter you can buy a much better turntable. Another option to consider is to buy a vintage turntable. You can certainly find a much better pre-owned turntable at the same price. The AT-LP60 is super easy to use because it’s fully automatic. To set it up, you just need to install the platter and the belt which is really easy. This is a durable record player with a very nice sound. It doesn’t have internal speakers, which is good. My recommendation to you is to buy the Logitech Z323 speakers and you will get a very decent sound at a very decent price. If you find the Logitech Z323 too expensive, you can always buy any pair of powered computer speakers. Just keep in mind that the lower the price, the lower the sound quality. As you don’t need the USB port for computer connection, buy the one without USB because the price is lower. And if you ever need help setting it up, just send me a message and I’ll help you out. After reading all your reviews, I have just bought one, and I can’t wait to set it up. I’ve just got back into vinyl after many years digitised. I had a Crosley Cruiser for my birthday and couldn’t wait to send it back, it was horrible in too many ways. I can’t wait to get this AT connected up to my Sherwood and wharfdales. Thankyou for all the advise and I’ll report back at a later date. I’m glad you got back to vinyl. I’m sure you’ll enjoy your AT-LP60USB. If you have time, please share with us your experience and opinions on the AT-LP60 after some time of use. Other readers will benefit from your input. I appreciate you taking the time to comment here. Consumers are often frustrated by the work it takes to create/edit their MP3 files because the process is not automated even for turntables that include a USB port. There are two options: Some USB turntables by Jensen and TechPlay will write MP3 files directly to a USB thumb drive or SD card so you can go computer and “cable free” (the added benefit is that you can make MP3 files of pretty much anything else you can connect, assuming there is an Aux port). The other option is to purchase a better software solution that automates more of the process. Dak’s software supposedly breaks up the tracks into individual files to automate the process — but this software relies on a direct connection to a sound card on a computer. Keep in mind that most “direct-write” USB turntables create one long MP3 file, and they top out at 128 kilobytes (higher bitrate recording = better sound reproduction). Some manufacturers, such as TechPlay, offer options for manually inserting the breaks between songs upon playback/recording but because the documentation is so poorly written it can be difficult to figure out how to implement the process without a considerable amount of trial and error. I think it would be appropriate to review Dak’s software to see just how much “work” it takes out of the process (albeit, you will still have to tether the turntable to your computer). Thanks for your comment. I’ll update the post to include this software on my list. I would like to try it myself. If my budget permits I’ll buy a copy otherwise I may ask them to send me a copy for a review. Thanks a lot for the tip. Hi Francisco! My 13-year-old daughter has been looking at record players for her birthday in March and I was wondering if you could give me your opinion on these three that she is interested in. One of them is this one. She thinks that it will be a good choice because she wants quality sound, as well as the ability for it not to chew up her records. She has been asking me if she is going to be able to bring it to her friends house easily and just attach the speakers when she gets there. The next one is the Electrohome Archer. She likes the retro look and its portability. She is concerned about the sound quality, however. She wants good sound, but she is scared that it will come out like the Crosley Cruiser. She also is scared of the cartridge needle, and that it will damage her precious records. Lastly, she was interested in the Crosley Nomad. She likes the retro look again, and that she can download them onto her Mac. She also likes the big speakers on the side and thinks that the sound quality is going to be good, and that this is a good option for her since she can bring it to her friends house after school. She has heard about the stories about Crosley record players, and is concerned that it will damage her records. She is relieved that it has a magnetic cartridge so it wont do damage to her records. Thank you so much if you get back to this! From your description, I see that your daughter really needs a portable record player. The AT-LP60 would be kind of uncomfortable to transport. And then, you don’t know what type of speakers her friends have at home. She may not be able to play it. So, I would discard the AT-LP60. Although the AT-LP60 is one of my favorites, it’s really not portable. I would definitely forget about the Electrohome Archer as the sound quality is not very good, it has a ceramic cartridge and you can’t attach external speakers. My recommendation for your daughter is the Crosley Nomad. It’s portable, has a magnetic cartridge, usb connection and RCA inputs. Hope it helps. Happy birthday to your daughter!!! I don’t like the Electrohme Archer, but it really depends on your needs. For instance, if you need a portable turntable, the AT-LP60 is not a choice. But if you are not going to take your turntable from place to place, I would buy the AT-LP60. I have a mid-1970s Panasonic Technics turntable/8-track player/radio/cassette deck. Everything is in great working condition, except the turntable (it’s slowly dying). It has non self-powered Thrusters speakers. They’re not great, but decent enough at the moment. Can a AT-LP60 be rigged to use the Thrusters directly or even possibly through the Panasonic? Thanks for your comment. It is not possible to direclty connect the AT-LP60 to the Thrusters speakers since they are not self-powered. You may, however, be able to play it through your Panasonic sound system. Just make sure that it has RCA auxiliary inputs. If you have the model number of your old turntable I may be able to tell you with more confidence. Thank you very much for letting us know about the LP Gear upgrade kit. Your information is going to benefit other readers. I really appreciate you taking the time to report your experience. Thank you so much for your review!! I’m looking to purchase my first turntable and your review was way more detailed and helpful than other ones I have read. I’m fairly certain that I want to buy an AT LP-60, however, I’m having trouble picking a receiver. I checked out the ones you recommended to Sarah and I noticed a major price discrepancy, with the Lepai being around 30 and the Sherwood ones being over 300. Is a receiver something I should expect to spend a large sum on or is it possible to find one on a budget? What is a reasonable amount to pay and what will I be sacrificing if I spend less? Could you recommend some other options that would work well for this turntable? Thanks for the kind comments. Yes the prices can vary greatly. It really depends on what you are going to use it for. There are receivers that have many features. You may want to use it for audio, video or both. Many people have their receivers connected to their TVs, Mobile players, gaming consoles, turntables and who knows what else. If you just need the receiver for your turntable, I would’t spend a fortune. Now, the Lepai LP-2020A is just an amplifier. The big price difference between the Lepai and the other receivers is because the Lepai doesn’t have any of the features of a receiver. No remote control, sorround sound, multiple inputs, equalization, AM/FM radio. It’s just a small box that lets you connect your turntable to a pair of bookshelf speakers and control the volume, treble and bass. So, if you want to go the receiver route, expect to spend at least $220 on a receiver + speakers. The benefits being that you would be able to connect other devices, you’ll have a remote control and you will also be able to control the sound. But if you need a more affordable solution, I wouldn’t buy a receiver. Instead, I would connect the AT-LP60 to a set of computer speakers like the Logitech Speaker System Z323 with Subwoofer . You would get a very decent sound. You can control the volume and the bass. However, you won’t have any of the other features of a receiver. Audio Technica AT-LP60 + Logitech Speaker System Z323 with Subwoofer . Let me know if you need anything else. I hope I was helpful to you. I’m planning to hook up the AT- LP60 to Mackie CR3 – 3″ speakers (if you know about those). Would an amplifier or a receiver be more suited for those speakers? You can directly connect your AT-LP60 to the Mackie CR3 speakers. You don’t really need an amplifier. If you decide to buy a receiver, you’ll need passive speakers (bookshelf speakers) instead of the Mackie ones. If you want a simple setup, Mackie monitors are a great choice. You can read my post for more information and options. Thanks Francisco! I’m going with these speakers considering they’re not too costly and they look like a solid choice for sound quality. Gracias por tu comentario. La calidad del sonido del AT-LP60 USB es bastante decente. Todo depende de que bocinas (parlantes) y amplificador utilices. El audio que sale del USB tiene un nivel muy bajo. Yo recomiendo comprar la tornamesa sin el USB y así te ahorras unos centavos. En cuanto a la ION Pure LP, me gusta mucho su diseño, pero la AT-60 es definitivamente mejor. La ION Pure LP como otras de sus tornamesas tiene un cartucho de cerámica. Por el mismo precio, la AT-LP60 te va a dar una mejor calidad de sonido. La única ventaja del ION Pure LP es que puedes usarla con discos de 78 revoluciones. Can I plug this into my G4 laptop and use the itunes equalizer for playback, or would it be better to use a preamp? Good question Liam. I don’t have a Mac myself. I don’t think you can play your turntable through iTunes. You would have to use Audacity or another software to be able output sound from the turntable to the speakers. The AT-LP60 USB sends the audio signal to your computer through a USB audio codec. So you need a program that supports the USB audio codec. I’ll research more about this and I’ll post my findings here. But for now, the only solution I can think of is to install Audacity on your MAC and then select monitor audio. I was looking at a turntable for Christmas. I’m younger and just getting into vinyl. I was wondering if I could use the race female setup like you used with the headphones as an auxiliary input for my stereo system. My system is older and it has the 3.5 mm input and the bare wire inputs but not rca inputs. Thanks for your reviews! If I understand well, you want to connect the turntable to your old audio system that has a 3.5 mm input and no RCA connections. It’s hard to tell from what you are describing if the 3.5 mm input is a line level. I would think that you will be able to do that using the adapter cables that come with the AT-LP60. My advice to you is to make sure that the 3.5 mm input on your sound system receives a line level signal. How? If the 3.5 mm input has the words aux or line, then you’re fine. You can use the AT-LP60 with your sound system. If you want, you can send me a picture of your sound system’s input port and I’ll be able to tell you for sure. You can also give me the brand and model of your sound system. In short. From what you are telling me, I think you can safely connect the AT-LP60 to your old system. If you want to be 100% sure, you can give me more information by replying to this comment or by sending me an email via the contact page. You could also use jack or sunflower to route your audio. You need to be comfortable with technology if you want to use these tools. I’ll keep looking for solutions. I bought the usb version a couple of years ago – alas, the usb bit is pretty much a bad joke, should have saved the 20 clams and gotten the regular one. Other than the useless usb, the TT is VERY impressive. The only complaint I have is, the damping on the autoplay, or should I say lack thereof…. It just sort of plops the needle down, can’t be too good for the stylus, or the record. I que it manually, so it’s not a big deal for me. I’ve since acquired a near mint Pioneer PL-540 circa 1978, and as soon as I decide which cartridge to get for it, the AT LP 60 will be replaced. But I can definitely say, the ’60 has been a real dependable work horse, and it got me back into vinyl, after many years of CD reliance, so it will always be special to me. I strongly recommend it to anyone looking to get into (or back into) vinyl! Thank you very much for your comment. I agree with you, the USB is not worth the price. It’s better to save few bucks and get a regular one. The damping mechanism isn’t that bad in my opinion. My hand isn’t very steady so I still prefer to use the up-down button. Congrats on your Pioneer PL-540. Buying vintage turntables is always a good option. You generally get better equipment than the new models on the market at a better price. Thanks for a very good, concise, and clear review 🙂 I’ve been interested in one of these for some time, but wonder how some parts such as spindle bearing and arm bearings feel…are they loose with a bit of rattle, or do they feel tight with no play? On my unit, the spindle bearing feels just right. The tonearm feels a little bit loose and flimsy. The buttons also have a flimsy feel. But to be honest, for the price, the AT-LP60 is a very decent turntable. We were talking about the Crosley Cruiser on another post. Well, the difference in price between the Cruiser and the AT-LP60 is about $20. It’s just a no brainier, for $20 more dollars you get a real turntable, not a toy. Plus, Audio-Technica has a great reputation and a great customer service. The AT-LP60 USB is more expensive than the AT-LP60. The sound coming out of the USB is not too loud. I own the AT-LP60 USB, but if I had known, I would have probably bought the AT-LP60 without USB and save some bucks. If you really need the USB port, you can always buy an analog to digital converter. For most people, the computer’s soundcard will be enough for digitizing your LPs. I agree with you that the main spindle bearing is nice and tight, and turns quietly and smoothly, and that the arm bearings are not as tight as I would like them – I have a couple of 80’s Technics turntables too and those arm bearings are superb!! However, I must say that I’m astonished by what this turntable can do!! I checked the tracking weight and it’s around 3.5 grammes, which isn’t too bad for a MM cartridge, though I must admit I would prefer a little lighter, but this is within the specs for the cartridge used. From what I can tell of speed stability, I have no complaints….. it plays at the right speed and there is no wow & flutter that I can hear…. I made the mistake of plugging it into UK socket without a converter. Consequently I think the motor has burnt out. Can I get this replaced or is it fit for the bin now? I’m sorry to hear that. I’m not sure if you can replace the part. My guess is that it is possible to replace it. The problem would be to find the replacement motor and check the price. My advice to you is to contact Audio-Technica. Here is the contact information for the UK. I have an AT-LP60, I’ll open it to see if the motor is easy to replace. I’ll get back to you with my findings. 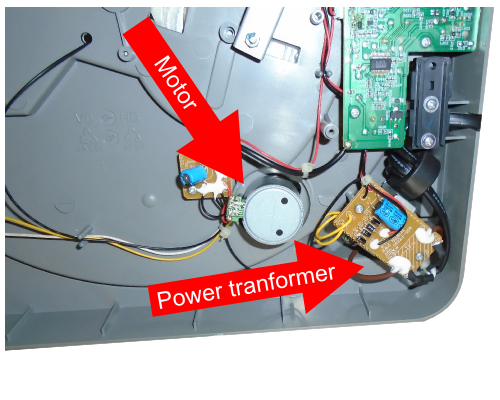 You can also check this interesting video, in case you want to disassemble your unit. Thank you so much for your prompt response and help. Fingers crossed I can salvage it! I opened my AT-LP60 USB. It is easy to open. Just a few screws. I’m thinking that the motor wasn’t burnout, it’s probably the power transformer. The pieces are soldered, so it’s not an easy task to do it yourself. I still would advice you to contact Audio Technica. I’m sure they can fix it for you. I don’t know how much it would cost though. Here are two images that I took from my unit. I’m really considering purchasing this turntable as someone who has just recently gotten into records and wants something that will last and not eat away at my records with heavy tracking force. I was wondering what speakers you would recommend for the simplest set up you described and what receiver and speakers you recommend for the next set up you described (TT, receiver, non-powered speakers). I’m trying not to break my bank with this so anything on the more affordable side would be appreciated. I think the Audio-Technica AT-LP60 is a great option for you. I own one and I like it. I bought it few months ago, so I can’t tell you about its durability from my own experience. However, I have read many reviews of people that have had it for a long time without issues. If you find the above speakers too expensive you can replace them with any type of computer speakers. Obviously the cheaper the speakers the lower the sound quality. Just be aware that with this setup, you have to adjust the volume manually with the speaker’s volume knob. This may be a small inconvenient. The advantage of having a receiver is that you can control the volume through a remote control and you can also connect other devices you may already have. There are many receivers, but they are usually expensive and many modern receivers don’t have a PHONO input, which should not be a problem because the AT-LP has a built in pre-amp. I chose the Sherwood ones because they are affordable. Do you need strictly a receiver to use the speakers? Or Can you Connect them in another way ? Can you conect the turntable to the pc vía usb and then Connect the powered speakers to the pc? You don’t necessarily need a receiver if you use powered speakers. Power speakers have a power cord. You can directly connect a set of powered speakers to the AT-LP60 USB. Just make sure to set the preamp selector to line. You can also connect the Turntable to the PC via USB and then connect the powered speakers to the PC. You are going to need audacity or some other software that allows you to output the sound through the USB Audio driver. It’s perfectly possible. You can read my article 5 Powered Speakers for ATLP60 for more information. Thank you for your information!, i read all the comments and i bought a AT-LP60 without the USB because you guys said that was better to buy the regular one and save a few bucks, can i connect the turntable to the sound card via the 3.5mm adapter and then connect powered speakers to the pc?, what are the benefits to connect the turntable to the sound card of the pc?, thank you again for all your information, this review was very useful for me to decide to buy the AT-LP60. Yes you can connect the turntable to your sound card via the 3.5 mm adapter and connect speakers to the PC. The benefit of connecting your AT-LP60 to your PC is that you can record your LPs and digitize them. Then you can either burn a CD or transfer them to your mp3 player or smartphone. If you are not going to digitize your music, I wouldn’t even bother to connect the turntable to the computer. Instead I would connect the turntable to external speakers, receiver or sound system. Did I answer your question. Let me know if you need anything else.